Located on South America’s north Atlantic coast, Georgetown, the capital of Guyana was the home for a recent Basic Umpires Course. Organised under the auspices of ITTF High Performance and Development, in liaison with the Latin American Table Tennis Union, proceedings commenced on Wednesday 25th July and concluded on Friday 27th July. Venue for the whole itinerary was the Cliff Anderson Sports Hall; the expert on duty was Colombia’s Yoanna Ramirez. Overall a total of 19 students attended; in addition to Georgetown, they travelled from East Bank Demerara, East Coast Demerara, Essequibo and Linden. “It was very satisfying to find a group with such enthusiasm and a willingness to learn; all were motivated and committed. They were focused on where they want to go and how to achieve their goals. In addition to being able to help the students with my knowledge and experience, the objective was also to give them the tools to develop their umpiring career. It is not beyond the bounds of possibility that with effort they could even officiate at such prestigious events as the Olympic Games.” Yoanna Ramirez. A motivated student, it was a similar response from 37 year old Leona Kyte. Enthusiastic the views of Candacy McKenzie and Leona Kyte were echoed by Maurice Cummings. 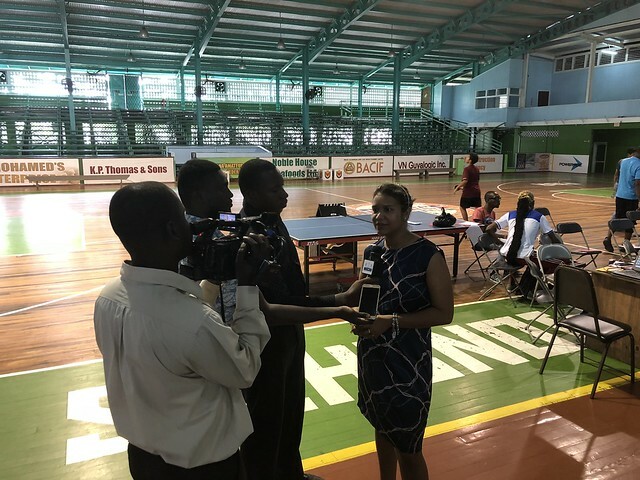 Delighted students and it was also a delighted Godfrey Munroe, the President Guyana Table Tennis Federation. A total of seven students reached the required level to become qualified basic umpires. The participants were: Chioma Archer, Elthon Browne, Steve Critchlow, Maurice Cummings, Debra Daniels, Moeth Dasilva, Mark Evans, Shavin Greene, Raphael Hunter, Elishaba Johnson, Paul Jones, Mohamed Khan, Leona Kyte, Isaiah Layne, Candacy Mckenzie, Aneka Phillips, Kevin Prass, Thuraia Thomas, Junior Wilson.